An excellent way to start the day:-) How the hell did they persuade him into that getup. 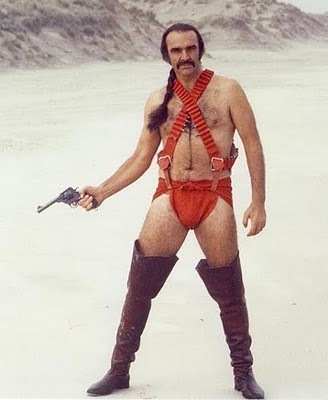 I’m not sure which part is more hilarious, the boots or the red whatever-it-is-thing. thank so much for sharing. Mind you, don’t necessarily knock ponytails on men, it’s the one saving grace of the picture. I almost feel like i have to watch the film for some kind of explanation for why he is dressed like this. Congrats on completing the a to z, looking forward to whatever your blog contains the rest of the time. I’ve seen this, late at night, after a heavy night, and though I remember nothing of the time before nothing will scrub that costume from my mind. Great A-Z and well done. I have to do something similar. This was a great series of posts. Perhaps next time an A-Z of the worst you’ve seen? The possibilities are endless. Another A-Z but taking recommendations perhaps – I got a lot of great ones on Twitter most days, though finding time to watch them all could be tricky! Outfit of the week, for sure!